VOLTmaster PTO Generators are designed as a standby electrical power supply and utilize the power take-off from tractors, bulldozers, or trucks as the prime mover. To connect the generator to the tractor PTO, an attachment kit is required. The kit consists of a shielded universal telescoping shaft, pin and coupling. Both ends have a 1-3/8 inch 6 spline coupling. Works with VOLTmaster PTO15-12, PTO30-25, PTO47.7-1 and up through 50kW. 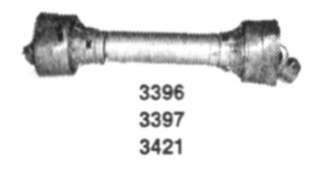 When this shaft is used with a three point hitch or trailer it may have to be cut shorter. See last page of instructions below for details.